The Chinese New Year officially starts on Tuesday 5th February, welcoming in the Year of the Pig. The Chinese zodiac is a repeating cycle of 12 years and the Pig is the twelfth of all the zodiac animals. 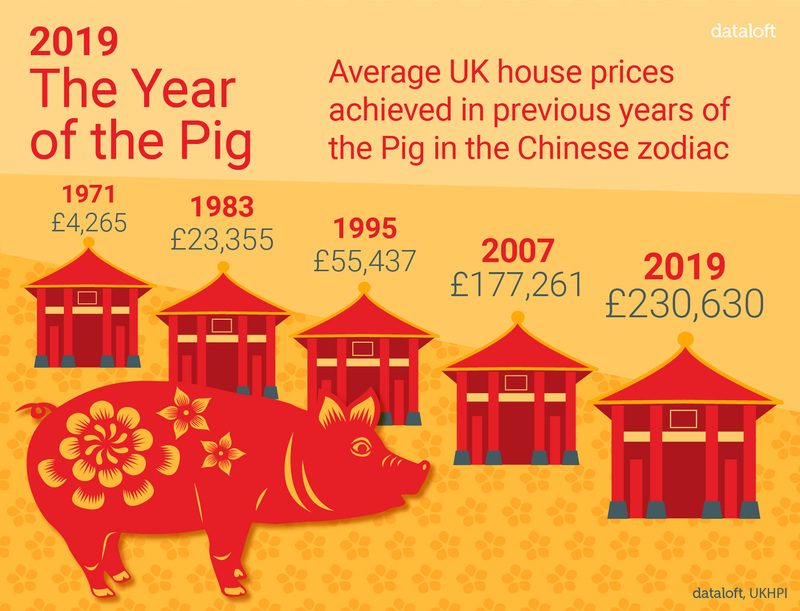 Since 2007, the last Year of the Pig, the average price of a property in the UK has risen by 30.1%, the equivalent of over £53,000. The largest increase however, happened between 1995 and 2007, when average prices tripled. Since 1971, price growth in the Year of the Pig has averaged 6.2%. HM Treasury latest consensus forecast for 2019 is for average prices to rise 2.2%. In Chinese culture, pigs are a symbol of wealth, have a beautiful personality and are blessed with good fortune in life. They are also realistic. This last characteristic may well prove fitting for the housing market of 2019.